I went to see the Horniman Museum's Body Adorned exhibition on its last day at the weekend. I wish I'd gone to see it sooner. From the description, I thought The Body Adorned was going to be an exhibition about the history of fashion, clothing, jewellery and body art. It was actually more about the psychological and cultural reasons we choose to adorn our bodies in the way we do - with clothes and accessories as well as by such things as piercings and tattoos. There was also quite a big section on magical clothing, including the items in the pictures above and to the right. Had I known about that, I would have gone to the exhibition much sooner and blogged about it in plenty of time to recommend it to anyone reading my review. Oh well, I'll try to be a bit more on the ball next time. The photos show items on display under the title Magic, Religion and Healing. The description by the case pictured above said: "Magic, religion and healing have always been major areas of interest for anthropology curators. Dress is associated with magic, religion and healing and was collected to better understand the beliefs surrounding this relationship. Some items of dress are believed to have powers to heal or to impart power to the wearer." 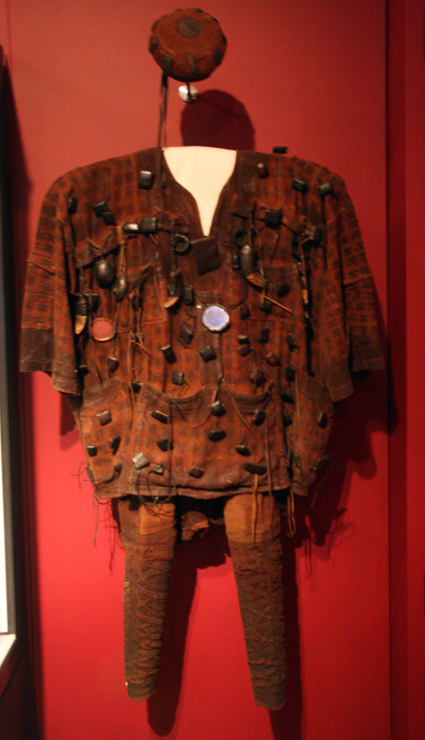 The display included pieces of costume collected by anthropologist Evans-Pritchard, who did work on magic in the Sudan area of Africa in the 1930s. 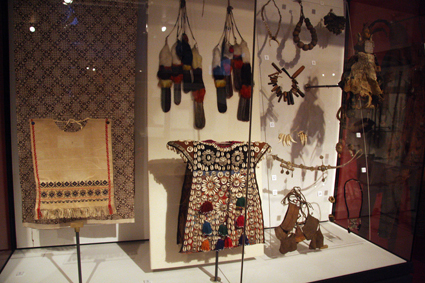 The costume on the right, against the red background, is a protective garment from Bamana, Mali, in West Africa. It was worn by a hunter and is adorned with amulets to represent skill and also offer protection. The descriptive panel close to it said: "In many places and for many people across the world clothing is believed to confer natural or supernatural powers to its wearer. It is common to speak of having a "lucky" item of dress." One of the things that fascinated me about the magical clothing on display was that although they came from cultures and eras very different from the one I live in, and might be a different style to anything I would wear, the way magic was perceived to work isn't vastly different from the way I might use it. I've written in the past about lucky clothing, and I certainly have pieces of jewellery that I consider to be protective amulets or which I have enchanted to offer a little magical aid. Had I been curating the exhibition, I think I would have added a modern football fan's lucky underpants to the case, just for comparison.